Real Madrid has overtaken Manchester United as the world's most valuable football club, according to business magazine Forbes. It is the first time that Man Utd has lost the top spot since Forbes first started compiling its list in 2004. Forbes now values the Spanish giant at $3.3bn (£2.2bn), with Man Utd in second place on $3.17bn. Barcelona is third. 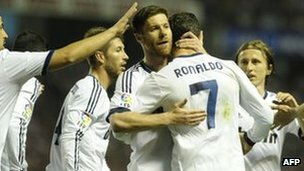 Forbes said Real Madrid's financial success came despite the continuing woes of the Spanish economy. "Real Madrid has been consistently delivering the highest revenues of any soccer team in the world, despite an intense economic meltdown in Spain," said Forbes. "With superstars like Cristiano Ronaldo on the pitch, and coach Jose Mourinho on the bench, Real Madrid has thrived under the leadership of billionaire president Florentino Perez." In coming to its figures, Forbes looks at a football club's various revenue streams, such as television money, ticket sales, merchandise and concessions.